Heat oven to 375°F (350°F for dark or nonstick pans). Lightly grease or spray cookie sheet. In large bowl, beat cake mix, pumpkin pie spice, pumpkin and butter with electric mixer on low speed 1 minute. Stir in raisins. On cookie sheet, drop dough by generous tablespoonfuls 2 inches apart. Bake 10 to 13 minutes or until set and light golden brown around edges. Cool 1 to 2 minutes; remove from cookie sheet to cooling rack. Cool completely, about 30 minutes. Frost with frosting. Store loosely covered. If pumpkin pie spice isn't handy, use 1 teaspoon ground cinnamon, 1/2 teaspoon ground nutmeg and 1/2 teaspoon ground ginger instead. You can add 1/2 cup chopped pecans or walnuts. 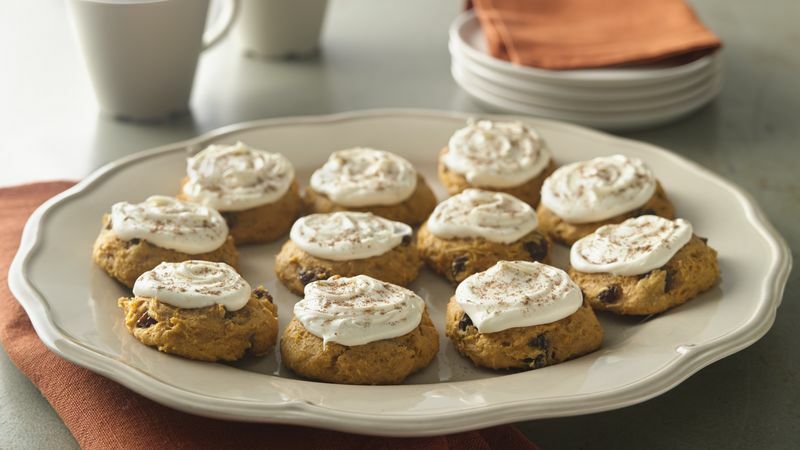 Sprinkle the tops of the frosted cookies with pumpkin pie spice or ground nutmeg for an extra flavor boost and a special look. In place of the butter, you can use 1/4 cup vegetable oil.